It’s Freedom to Read Week! 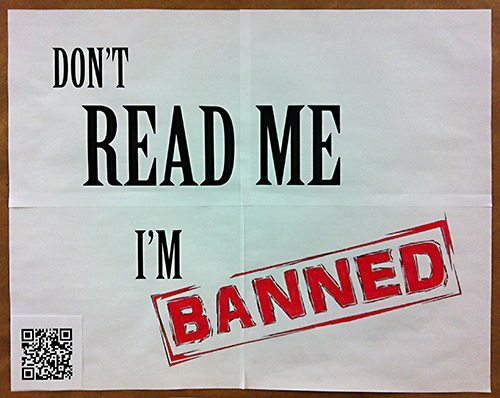 Join OCAD U Library until March 1 to celebrate intellectual freedom, visit the “Don’t Read Me I’m Banned “display. On display are books from the library’s collection that have been banned or challenged around the world, as recently as 2010. Free a banned book from the censor’s wrappings! Check out a title today. 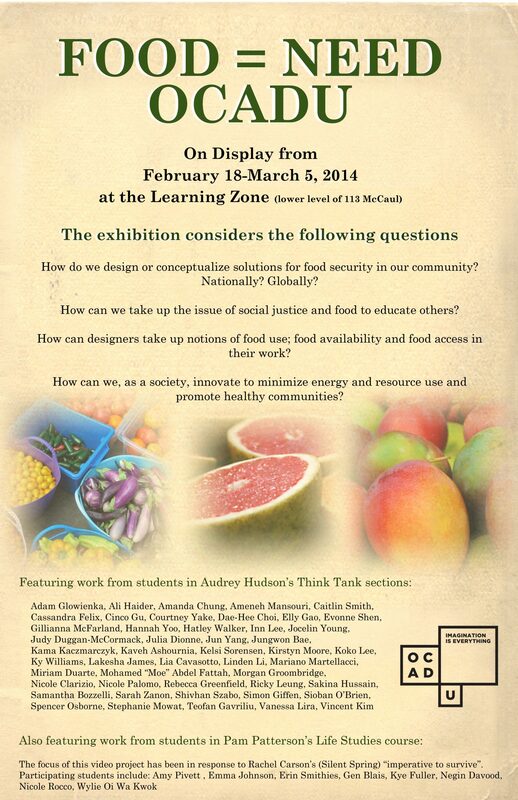 March marks the second sustainability month at OCADU, and leading up to the month of activities acknowledging student sustainability projects and engagement, the Learning Zone is holding an exhibit looking at food availability and sustainability. The Food=Need Exhibit — on display from February 18 to March 5 — is a multimedia installation featuring poster designs and booklets from the students in Audrey Hudson’s Think Tank courses. The creative responses from the Think Tank courses address food availability, food access and food use around the subjects of food co-ops, gardening, nutrition, schools & food, labelling food, art/design food activism, narratives of food, and community development projects. The Video work from Pam Patterson’s Life Studies course address sustainability and food insecurity in and through diverse populations and people. 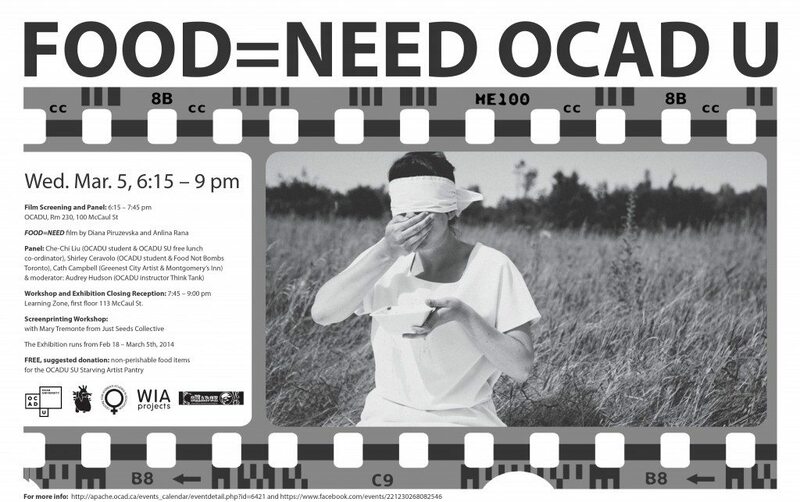 On March 5th, the closing night of the exhibit, there will be a screening of the short documentary film Food=Need (based on the Food=Need community performance art event curated by WIA projects in the Fall of 2013), a panel discussion on the politics of food insecurity and the value of creating sustainable food-linked projects, and a silkscreening workshop lead by OCADU IAMD graduate student and Just Seeds Collective member Mary “Mack” Tremonte. The exhibit was put together by an organizing committee made up of Marta Chudolinska, Audrey Hudson, Chechi Liu, Paul Moleiro, Takako Namura, Pam Patterson, Hareem Qureshy, Leena Raudvee & Mary Tremonte. Yes, the LZ will be open during Study Week! Looking for a quiet place to study, create or chill, the Learning Zone and OCAD U Library will be open regular hours during Study Week with exception to Monday February 17th, both are closed for Family Day. OCAD U Library Used Book Sale! 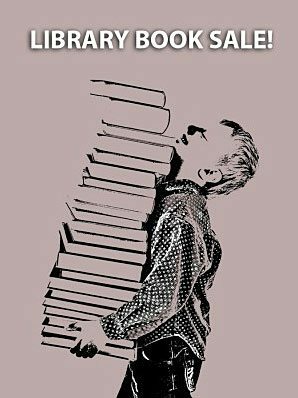 OCAD U Library is having a used book sale! February 10th and 12th from 9 to 5pm, in the Lobby at 100 McCaul Street. An awesome collection of art & design books, mostly duplicate copies of titles in the OCAD U Library, donated by alumni, faculty and friends. Proceeds raised from the book sale supports the library, providing new resources to enrich the learning experience at OCAD U. Great books at great prices! We are pleased to welcome Doug Beube to the Learning Zone on Monday February 10th at 3:30pm for a presentation and discussion of the works from the student and faculty weekend workshop – Radical Bookwork: Dis/connecting the Altered Page. 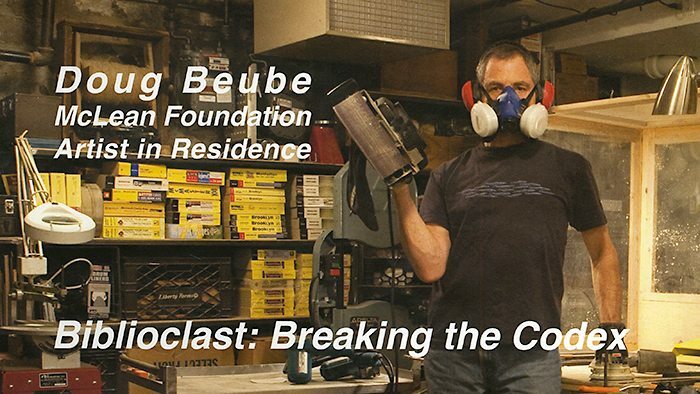 Beube, a mixed-media artist who works in collage, installation, sculpture and photography, deploys book media in a transformative structure referencing the dimensionality and dynamics of digital information. His sculptural representation of books simulates behaviours from the digital domain, such as cutting and pasting, but he uses power tools and glue rather than keystrokes. All are welcome to join us and view the works produced!